Call of Cthulhu role-playing game. 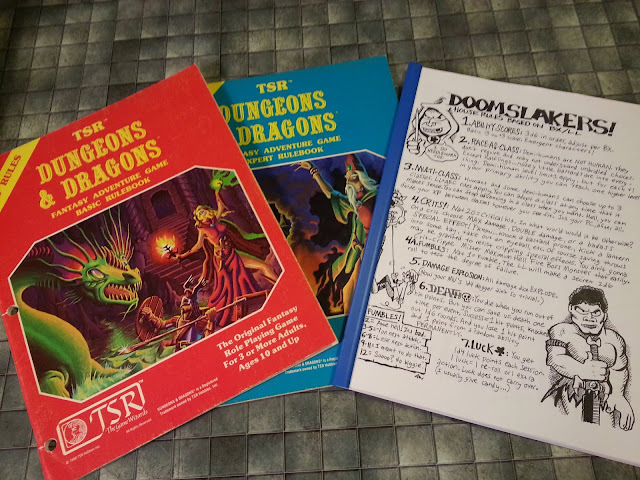 Don't get me wrong: I had been aware of the game for some time, having seen ads for it in a text-only mail-order catalog I had from some now-forgotten source, as well as in my copies of Dragon magazine. Between college classes, circa 1986(? ), I wandered into the local B. Dalton bookstore (back when the local mall actually had two bookstores, which is two more than it's had for the last 15 years or so; this speaks volumes about the area in which I live) as I made my usual rounds: hit the bookstores and peruse their science fiction/fantasy and RPG sections, and hit the toy store and peruse its game section (back then, you still had a fair chance of locating RPG's in KayBee Toys). The day in question, I wandered to the back right corner of the store and found the usual (the contents of which I don't recall exactly, but were likely mostly composed of various D&D rule books and supplements). I was about to leave, as I hadn't expected much more, when I glanced up at the top shelf, which I'd previously neglected. There sat a hardcover book, noticeably taller then all of the D&D books, and featuring a dark cover with the words "Call of Cthulhu" standing out in striking yellow contrast. My heart leaped as I snatched the book down and began leafing through it. This map saw play twice. The first time was in my home-brew Top Secret/Villains & Vigilantes/Chill mash-up. 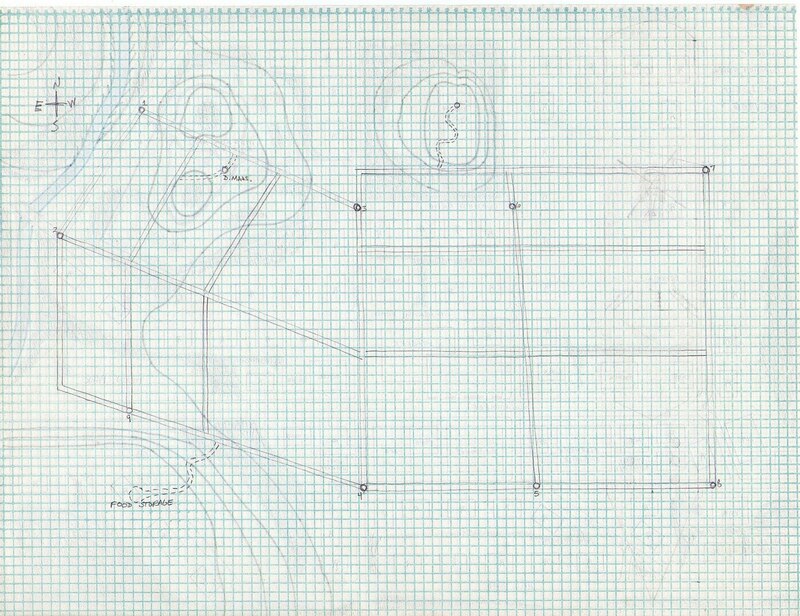 With a plot that was also liberally lifted from the aforementioned horror flick, and heroes that were more like super-heroes, the game I ran for my nephew (and played in, just as I had in all of our D&D and Top Secret games) was a blast, as our agents hunted down and terminated with extreme prejudice Mr. Jerry Dandridge, vampire. 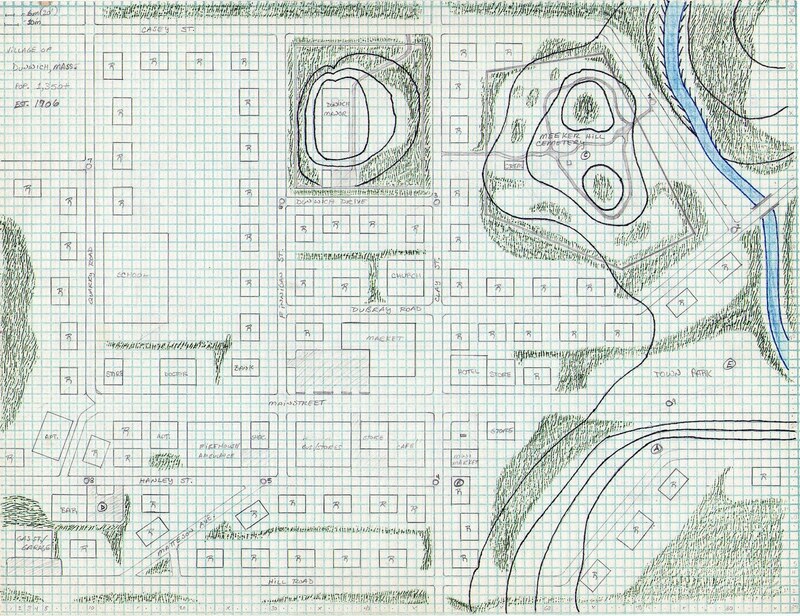 My Dunwich map didn't see use again until 1989 (IIRC), when it was featured in my very first attempt to run Call of Cthulhu. Still nervous about the historical nature of the setting, I nonetheless resolved to run it for my new game group, as we were knee-deep in horror role-playing. The scenario found a trio of intrepid Investigators (Call of Cthulhu's name for player characters, for those not in the know) looking into disappearances in the town. I'd recently read Lovecraft's "Lurking Fear," and was struck by the mental images many of the scenes in that story had conjured for me. In particular, the scene where the narrator spends the night (if only partially) in the old Martense mansion - and loses his big, strong bodyguards to lurking terrors - stuck in my mind, and I labored to build a scenario that would find my players' characters in a similar predicament. Of course, being players, they didn't act as I'd hoped: their characters didn't opt to spend the night in the mansion, which is featured prominently on the map. (cough-cough-bastards!-cough) Instead, they staked out the mansion from the "safety" of their car on the street outside. Despite their attempts to derail the sanity chiseling I'd planned for them, they were compelled to follow a suspicious dark shape into the sewers after it had attacked their car in the moonlight. 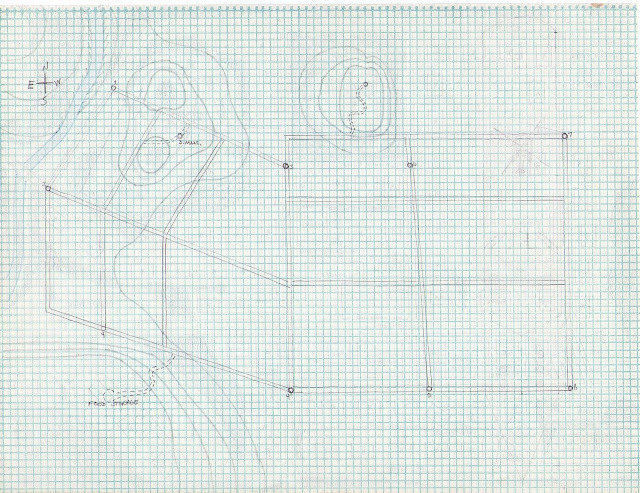 (Thus the sewer plans on the back side of the map, added years after its initial creation.) The trail led them into a series of tight, crudely dug passages (thank you, Martense family! 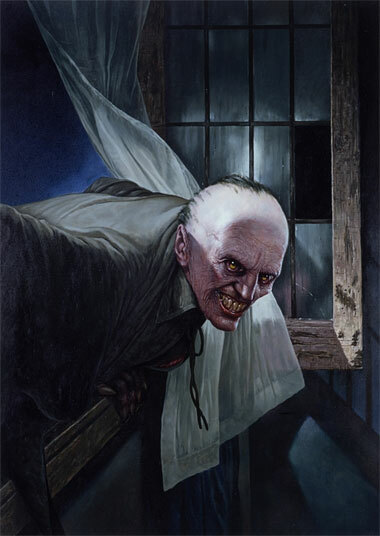 ), and - ultimately - to the larder of a pack of ghouls. 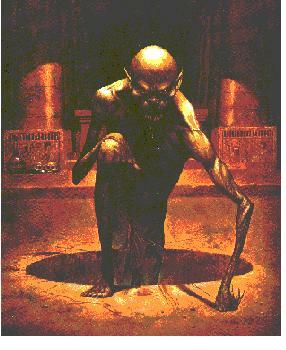 Much sanity, blood, and spent brass was spilt upon the earthen floor of that chamber. To this very day, the atmosphere of that session has got to be one of the most memorable of any game I've ever played. It cemented my love for Call of Cthulhu. 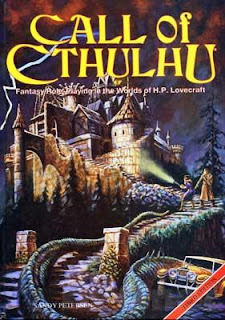 I've since run several sessions of Call of Cthulhu, and I've found that -with the proper players, people willing to immerse themselves in the role of everyday people swept up by nightmarish winds - it invariably produces some of the most memorable "this one time, in a game" stories for those involved. 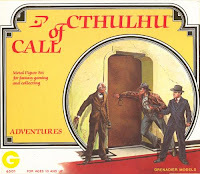 I find Call of Cthulhu to be one of those rare RPG gems: a game system that is fully functional, flexible, and - best of all - stays out of the way when it's not needed. Too many games force their way into game play, whether in the name of expanded functionality, player empowerment, enhanced story, or whatever. Not so, Call of Cthulhu. The game does what it needs to - no more and no less. I find it to be a brilliant piece of RPG design, an opinion testified to by the fact that its five (soon to be six - yay!) subsequent editions have only made the most minor of changes to their predecessors. Over the past few months I've been falling in love with CoC all over again. I discovered the game and Lovecraft in 1983, and both probably had a greater impact on me than D&D. Thanks for sharing your story (and the maps!). This is one of the best RPG blog entries I've read so far this year. "This one time" is a very apt way of describing this, my favourite rpg. Most of my fondest gaming memories come from this wonderful game. I too have that beautiful Games Workshop edition -- their Runequest is also quite a nice book -- and I'm looking forward to the new edition. Great post! And very cool map. I recently have started running a CoC campaign for the first time (I played a few times in the 1980s), and am enjoying it very much. I've only run two adventures so far, but already we've had a couple of memorable "this one time" experiences. @Robert: Thank you! I'm glad you liked the post. I've never seen the GW edition of Runequest - I'll have to add that to my list of things to look into. Very cool post. I actually use CoC as kind of a demarcation line in my life that indicated my first real transition to adulthood. It came out during my freshman year of college. I was still living at home and going to school, and I desperately wanted a copy of the game. Unfortunately, none of the local stores were stocking it, but I had it on good authority that a shop in Austin (70 miles and an entire world away) carried everything Chaosium published. A road trip ensued. A secret road trip, since my parents wouldn't have let me take my car out of town. I'd never driven that far, had only a vague idea of how to get to the shop in Austin, and blew up my air conditioning on the way home, but I got it. The car is long gone, but I still have my first edition boxed set of CoC. @Theron: Great story! :D I recall many similar road trips (aka gamer pilgrimages) from my youth.